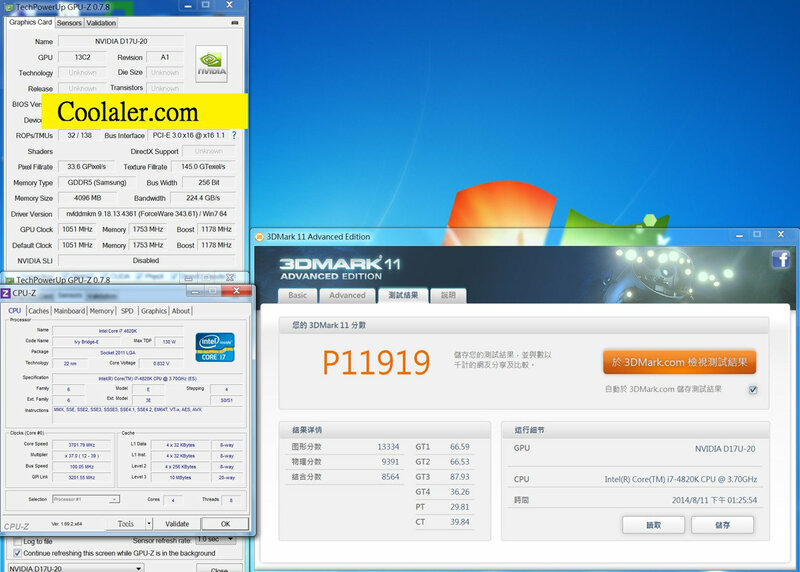 After the leaked of an alleged 3DMark FireStrike Extreme benchmark result of the GTX 880, another benchmark result was recently leaked. This time it’s not for the GTX 880, but for the NVIDIA GeForce GTX 870, which is said to be the “smaller brother” or trimmed down variant of the GTX 880. 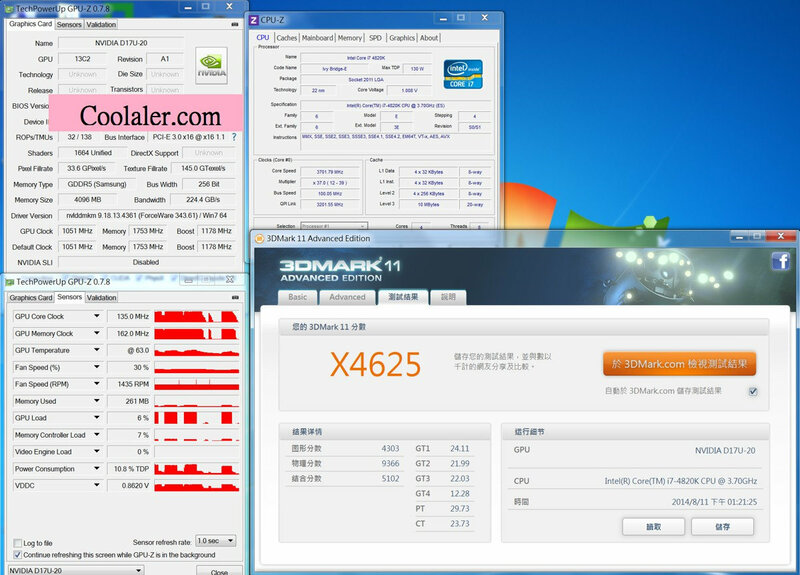 The GTX 870 benchmark leaked came from Coolaler, unfortunately there was not enough information except for the desktop screenshots with a GPU-Z, 3DMark 11 and CPU-Z on those screenshots. See the results below. The name of the graphics card appearing on the GPU-Z and 3DMark 11 screenshots is NVIDIA D17U-20, most probably because these versions still doesn’t support the next generation GTX 800 graphics cards yet. According to the leaked GPU-Z screenshot of the GTX 870, it will have 32 ROPs and 138 TMUs, and most probably 13 SMM or more. The upcoming GeForce GTX 870 will also sport 1664 unified shaders (CUDA Cores), 33.6 GPixel/s or pixel fillrate and 145 GTexel/s of Texture fillrate. It will have 4GB of GDDR5 memory running on a 256Bit memory interface, and with a bandwidth of 224.4GB/s. The GTX 870 has a GPU clock speed of 1051 MHz with a boost clock speed of 1178MHz, and a memory core clock speed of 1753MHz. Just a reminder that some of the values revealed on the GPU-Z screenshot might be inaccurate since that GPU-Z version used doesn’t fully support the next generation graphics cards yet. But if we compare this with the specification of the GTX 770, we can see some improvements already. The GTX 770 has a base clock of 1046MHz, boost clock of 1085MHz and 134 Texture fill rate. It has only 2GB of memory, which is doubled in the GTX 870, but runs on the same 256-bit memory interface. I also checked various 3DMark 11 benchmark results of the current GTX 770, and generally the Performance benchmark result of a GTX 770 is around 10,500++ points, while the Xtreme score is around 3600++ points. Clearly, those alleged 3DMark 11 results of the GTX 870 are higher compared to the GTX 770’s benchmark results, and it’s almost on par with the GTX 780. The GeForce GTX 870 will be faster than the GTX 770, there is no question about that. But will it be faster than the GTX 780 as well, or at least has the same performance of the GTX 780? Also how much the GTX 870 would cost us? Those are some questions that are currently unclear or unknown as of the moment. The only obvious thing I see is that we would see some price cuts for the GTX 780 and 770 once the next generation GTX 880 and 870 are released. The NVIDIA GeForce GTX 880 is expected to be launched this coming September and the GTX 870 might follow on October.